Your podcast host went to Florida and all she got you was...a workout video?! Tired of working out indoors or want to change up your workout routine, but have minimal equipment? Today, I'm sharing a workout video that features 8 cardio fitness moves that can be done with just your body weight and an exercise bench or step. A video from a podcast show? I know, I know...but I made this for you (or at least my Fit Armadillo fans) 3 years ago and never got to share it. Love it or hate it? I'm open to your feedback, because I have two more videos like this to help you tone up at home or the park while strengthening your upper and lower body, but I can keep them in the vault, if you aren't interested. 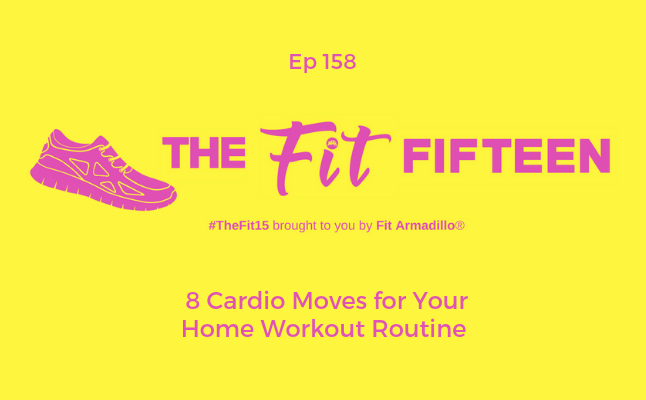 There are hundreds of combinations of workout routines you could create from the 8 cardiovascular fitness moves shared in the video above. 3. Complete your warm-up and cool downs as described above, but add in some upper and lower body strength training moves. Not sure what to try? If you let me know you liked today's episode, I will release another similar video next week. Share your feedback in the comments!